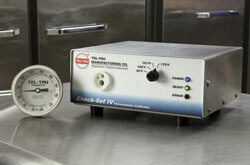 BBQ GRAND CHAMPIONS eliminate the guesswork and use only the best thermometers--Tel-Tru BBQ Thermometers. 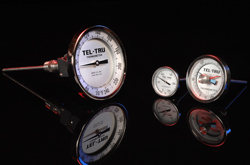 5" luminescent GLOW dial available - This remarkably easy solution permits anyone viewing the thermometer, up close in the light of day or far away at night in low light conditions, to easily see if their barbecue pit is cooking at the proper temperature. 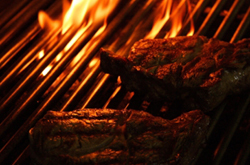 Luminescent GLOW dial available - This remarkably easy solution permits anyone viewing the thermometer, up close in the light of day or far away at night in low light conditions, to easily see if their barbecue pit is cooking at the proper temperature. “I built a homemade smoker/barbeque and I was looking for a better thermometer to mount on my smoker. I purchased a Tel-Tru BQ300 and WOW!!! This thermometer is great, the ACCURACY and the QUALITY are EXCELLENT. I just wanted to let all of you at Tel-Tru know how satisfied I am with my purchase. Thank you! 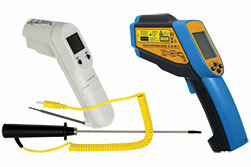 -Dan"
“As a novice, I found out quickly that you always want to use a good barbecue grill thermometer. My Tel-Tru BQ250 grill thermometer made controlling the temperature SO EASY. Thank you, Chris"
“Your BGE replacement thermometer is in a class by itself. Thanks, Mark"
"My custom Tel-Tru thermometer... I love it!! --Ryan"
Note: Every Tel-Tru thermometer is calibrated before shipping. All models that have an "R" at the end of the model name can be adjusted. Caution: Do not expose thermometers to direct flame. 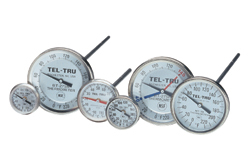 Do not use thermometers above dial maximum temperature, as damage may occur to sensing element.